Custom heavy duty freight cages for Hunter Express that improved efficiency and reduced the risk of product damage. 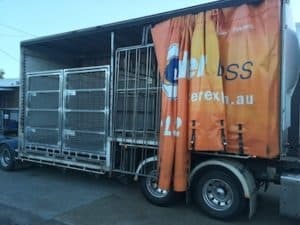 Hunter Express, one of Australia’s largest logistics companies, relies on freight cages to move small, awkward freight between depots. They had experienced ongoing issues with their freight cages, as they were lightweight and not designed to correctly handle the rigors of daily forklift and transport movements. In April 2017 Hunter Express approached Bremco Metal Products to design and manufacture 30 custom heavy duty freight cages to improve the efficiency of their interstate parcel movements. Brett Moody, Bremco’s Managing Director, worked closely with key Hunter Express personnel to design and manufacture superior custom heavy duty freight cages to withstand their transport load weights. Dramatically increasing the wall thickness of the square tubing. Introducing a new pre-galvanised steel checkerplate in the floor. This allowed the cages to be finished in a galvanised finish without the extra cost of hot dip galvanising such a large cage. Working with Orrcon Steel to identify a heavier duty square tubing, using their Australian made product called ‘Allgal’. The cages were custom designed to fit in the front compartment of an A Trailer on a B Double trailer system to an exact size of H 2400mm x W 1710mm x D 2310mm. The large freight cages were also fitted with a gate (double shot bolt style) on one end with a 270 degree opening hinge for easy ‘walk in’ access. The Bremco team designed, manufactured and completed these custom heavy duty freight cages in under three weeks, from Hunter Express’ sign off of the prototype design. Hunter Express Queensland State Manager Les Bihari was delighted with the finished product. Contact Bremco today to discuss how we can work with your designs and requirements to customise a solution for your business.